13 Dangers Of Working With An Author Mill (And How To Spot And Avoid Them) | Writer’s Relief - Writer's Relief, Inc.
You’ve probably heard the term “puppy mill”: It refers to irresponsible breeders bringing puppies into the world in huge numbers without properly caring for them. You may also have heard of a “diploma mill”: an unaccredited college or university handing out “degrees” to anyone willing to pay. But Writer’s Relief wants to be sure you are aware of one of the newest—and alarming—trends in the publishing industry: the author mill. Generally speaking, an author mill is a book factory that spews out as many titles as possible in small batches, with poor production quality, in order to make a profit off the writers. Unfortunately, the distinction between a publisher that is an author mill and a reputable publisher that simply cranks out a lot of books every year is not always crystal clear. And whether or not a company could be considered an author mill can be, to some extent, in the eye of the beholder. For instance, some of the most elite writers and editors in the industry label any publisher that relies on authors to market books and drive profits—even those that are honest, transparent, and upfront— as an author mill. But in today’s publishing marketplace, many reputable, traditional publishers have also shifted the responsibility of marketing and promotion to the author. Most writers consider author mills to be publishing houses that intentionally dupe hordes of unsuspecting writers into believing they have been “specially hand-selected” to receive (and ultimately pay for) publishing services that would otherwise be free at a traditional publishing house. Like puppy mills that send countless numbers of poorly cared for dogs to pet shops around the country, author mills thrive by taking on many, many writers’ book projects and publishing small print runs either by print-on-demand or short-run production. Author mills can offer digital book publishing services as well, but often there’s substantial emphasis on print. Author mills may or may not require writers to pay an upfront publishing fee (or fees), or they may require clients to purchase a set number of print books at the time of publication. Whether working in digital or print format, author mills will often take a percentage of the author’s royalties as commission—sometimes even if the author has purchased a large quantity of his or her own books. Author mills operate within a range of genres and fields. But more often than not, the primary clientele of author mills is made up of unpublished or new writers. Poets. Poetry books and chapbooks are often associated with low production costs. Poetry books can sometimes be as short as 30 to 50 pages, and yet they often command the same purchase price as published books that are much longer. For that reason, poetry books are a favorite of author mills. Low overhead for print publishing plus a few hundred copies sold equals a pretty good profit margin for the publisher. Poetry anthologies can be even more lucrative, since dozens of authors will often work together to sell a single published collection. Learn more: How To Publish A Poetry Book, Chapbook, Or Collection Of Poems. Novelists. Because getting a novel published by a reputable corporate publisher often seems like an insurmountable task, novelists can be especially eager (and feel validated) when they receive an acceptance letter from an author mill. Self-help authors. Writers who hope to help others by sharing their own life experiences are sometimes published by author mill publishers. Often, self-help writers are passionate marketers who believe in their ideas and ideals—which makes them excellent candidates for hand-selling small batches of their mass-produced books. Memoir and narrative nonfiction authors. Nonfiction writers may be thrilled when publishers agree to release their books; excitement makes it easy for authors to say yes to subpar partnerships. Academic writers. Believe it or not, some of the most highly educated people in the industry often fall prey to author mills (sometimes called paper mills in scholarly circles). Success in academia depends largely upon publishing in respectable peer-reviewed journals. Some author mill publishers cater specifically to scholarly writers, promising a veneer of critical acceptance to academic writers who are striving to publish in their fields. How can you determine if a publisher is an author mill? There are some red flags that can indicate a publishing house is more interested in making money off writers and less interested in creating a worthwhile, good quality product. The publisher’s client base is huge relative to the company’s size. Established, corporate publishers that have been around for a long time tend to have an enormous catalog of published titles. But author mills do too. For that reason, it can sometimes be difficult to tell the difference between a publisher with a strong reputation in its field and an author mill. Some author mills may have only a few staff members but thousands of published writers associated with their publishing house. Other author mills may have a larger operation—some are even global and enormous—with a list of so many clients that not all of them are listed on the publisher’s website. An author mill makes its money from writers—as opposed to book sales. The more writers it has, the more money it makes. If your potential publisher has only been active for a few years but has a backlist that rivals the biggest publishing houses, you may be looking at an author mill. The publisher doesn’t specialize in anything, and it is not organized into specific imprints/departments. The very largest traditional publishers operate, to some extent, as if they are many smaller specialized companies united under one corporate umbrella. A large publisher will have a number of publishing imprints headed by specific editors that cater to a target audience and specialize in a particular sort of book. For example, check out this list of imprints at Penguin Random House. Author mills, on the other hand, may not have such specializations. Because author mills thrive on accepting large numbers of writers—without an emphasis on quality—there’s no real need for editors to have expertise in a specific niche genre. Feel free to ask your potential editor if he or she has a specialization. But do keep in mind that a smart salesperson will key in to your suspicions and possibly tell you what you want to hear. The publisher offers little to no editorial support. Author mills want to turn out as many books as they can as quickly as possible. For that reason, an author mill is not going to invest much of its time into editorial guidance. A book that’s grinding its way through an author mill may get a quick read from an “editor” who pronounces it to be nearly perfect as is (or offers only a few cursory suggestions). Or an author may receive no editorial guidance at all. In some cases, writers may be given an option of paying for editing. While traditional publishers invest in several rounds of proofreading and copy editing (at no cost to the author), author mills may simply give a book a quick once-over before rushing it to press. The publisher releases anything and everything. Although the publisher may claim to have some standards—and may even reject a certain number of authors who are writing at a truly introductory level—editors are usually more than willing to take on a project if they get the sense that the author is willing to be a great sales partner (or if the writer is willing to pay in some way). Author mills never require literary agent representation and are always willing to read unsolicited submissions. The publisher sells services and upgrades to its writers. So-called extras like proofreading, editorial consultation, marketing support, or upgrades to cover art and production quality suggest that a company is more interested in making money from writers than it is in selling products to readers. The more upgrades and services the author purchases, the more money the publisher makes. The publisher asks the author to invest in some part of production costs. If an author is paying a publisher (and not the other way around)—even if the publisher positions itself as embracing traditional publishing ideals—the company is probably an author mill. The publisher asks writers to buy a certain number of copies of the printed book or guarantee a predetermined number of book sales. Traditional publishers tend to offer clients some copies of their published books for free. Author mills often ask writers to pay for copies. That said, some publishers are sneaky about how they compel their writers to pay for so-called “free” copies. An author mill might give writers a number of “free” copies—as long as they purchase a certain publishing package or service upgrade. The publisher’s website promises writers they will get paid for publishing their books. Traditional publishing houses don’t actually have to spell this out. Of course writers will get paid. If a potential publisher is promising a big paycheck—it’s a sales pitch. Traditional book publishers sell to readers, not to authors. The publisher’s website focuses primarily on getting new writers to work with them. If a publisher’s profitability is driven by book sales, then the focus of that company’s website should be selling books to readers. But an author mill focuses on selling paid publishing opportunities to writers. The publisher’s website offers confusing terminology or too-good-to-be-true deals. Promising large payoffs that go beyond publishing industry royalty standards is often a sign of an author mill. And if trying to understand a publisher’s basic business model requires lots of mental contortions, writers may be right to be wary. The publisher offers free information packets and marketing/publishing guides in order to collect writers’ personal information. Again, an author mill’s emphasis is on bringing in as many writers as possible. Giving away freebies in exchange for email list sign-ups is one way that author mills can convert writers who are browsing into writers who are buying services from them. The publisher has been sued. If a company faces legal action for how their services are represented, they could be an author mill. The publisher’s author discounts are not impressive. Some author mills will offer their clients discounted pricing to purchase books. But if the prices of those books are inflated to begin with, then the discount is not actually meaningful. It is not always easy to spot an author mill when you see one, so it’s important that writers always do their research before contracting with any publisher. 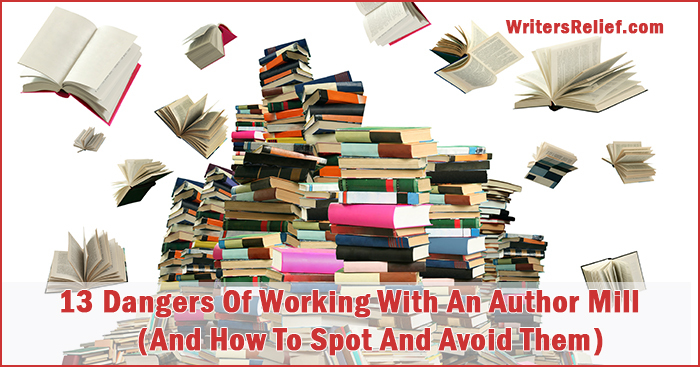 Know before you sign—what are other writers saying about working with your potential publisher? Search the Internet. You may be able to discover more information about a potential publisher simply by searching online. A lot can be learned by checking writers’ forums and blogs. Keep in mind that you may not specifically find the search term “author mill” connected to the publisher you’re looking into, since not all writers know or use that term. Instead, read between the lines and use your instincts to discern whether or not a company might be an author mill. Scope out Google ads. What other companies are paying to advertise if you do an Internet search on your potential publisher’s name? If the other companies who are advertising are other pay-to-publish corporations, that may possibly indicate similarities in business models. Caveat: We do not recommend basing your entire opinion about a company on Google ad comparisons. After all, Company A cannot be held responsible if a search engine allows Company B to appear as a sponsored, associated listing in search engine results. However, you may be able to use this information as a helpful supplement to your research. And, as a bonus, you may want to compare the services that your potential publisher offers with those that are listed in sponsored advertisements. Is the writing of decent quality? Is the copy clean and error free? Or does it seem like the publisher’s editorial standards are fairly low? Is the production quality good (nice fonts, quality paper, good printing, etc.)? Ask for recommendations from other writers. Join a writing group and talk to other writers about their experience with any potential publishers who might be interested in your book. Find a list of writing groups here. Head to the bookstore and ask for a book from the publisher. Bookstore owners are smart people who are familiar with reputable publishers within the industry. If they have any trouble getting a copy of a book from a potential publisher, that’s a big red flag. Did you recoup your investment (if any)? Were you asked to pay for any additional upgrades or services during the publication process? Do you feel it’s easy to get copies of your own book at wholesale cost? Were you happy with the production quality? Was the company easy to work with? Did they respond to questions and concerns quickly? Do you own all rights to your book? How many writers did you publish last year? Were any of those writers represented by literary agencies? Are the majority of your authors new writers, or do your authors have experience in the publishing industry? What potential investment opportunities are available to promote/upgrade my book? Will I be working with a specific editor who will offer me editorial consultation at no charge? How many rounds of proofreading and copyediting will my book go through prior to publication? Is that in the contract? Will I be required to pay for a certain number of copies or guarantee a certain number of sales? Will I have to pay anything at all? Some author mills regularly host writing contests. Contest organizers invite authors to submit their novels, memoirs, stories, essays, poems, or full-length collections for consideration and possible publication. Sometimes there are no submission fees associated with the contest; it’s totally free to enter. Seems like a good deal, right? But when an author “wins” an author mill writing contest—or is even listed as an honorable mention—that’s when the writer is asked to fork over a signed check. Author mill contests require “winners” to purchase copies of their own published writing. Often, winners are given the opportunity to splurge on upgrades that will make their published writing seem more impressive. For example: Writers may pay to receive their copies in hardcover instead of paperback. Unfortunately, poetry contests tend to be especially favored by author mills. The reason for this is simple: Publishers can squeeze many, many poems into a single anthology or collection, often publishing more than one poem per page in cramped font. The more “winners” featured in the book, the more copies of the book the publisher could hope to sell. Author mill writing contests also are known to offer winners the opportunity to participate in awards ceremonies—which are held at expensive, weekend-long writing conferences that require costly admission fees. It goes without saying that publishers make additional money when winners pay to attend expensive awards ceremonies. What’s So Bad About Publishing With An Author Mill? If you’ve ever spoken to a writer who does not realize that he or she has been published by an author mill (as opposed to a traditional, reputable publisher), you may find yourself reluctant to break the bad news. After all, writers are proud of their publications. They have the satisfaction of seeing their writing accepted and published. Who would want to take that feeling away? For writers who are not hoping to establish a reputable career in the mainstream publishing field, publishing with an honest, transparent, and upfront author mill might not be the worst idea. After all, if the goal is to get published, an author mill publisher can make that happen quickly. The writer may be pegged an amateur/dupe in professional publishing circles. The writer’s book may inadvertently earn a reputation for subpar quality by being associated with the subpar/not well-regarded publisher. Major book retailers often refuse to stock books that are published by author mills. The writer may be disappointed by the results of the investment, especially if there is little to no interest from the book-buying public. The writer may ultimately take a substantial financial loss. Author mills may sometimes refuse to correct errors, even when the author points them out. Because the cost of buying a book from an author mill is high, readers may be less inclined to actually purchase copies of the book. Once a book is shuttled from the sales department to production, the quality of customer service may lapse, leading to delays and frustrations for the author. Writers who publish with author mills may discover that there are a number of other books that feature the same exact cover art as their own title. The writer may not be able to publish the book elsewhere because some publishers are unwilling to consider previously published writing. The writer may be bound into a book publishing contract that is less than favorable and possibly very difficult to get out of. Other common complaints include difficulty communicating with staff, unexplained publication delays, difficulty ordering books, sudden and arbitrary policy changes (such as increases in shipping costs or price hikes), questionable royalty accounting, and browbeating or harassment of writers who question or complain. One author mill is known for its habit of threatening its authors with legal action if they speak out about their problems. How Can You Get Out Of Working With An Author Mill Publisher If You Have Already Signed An Agreement? Unfortunately, writers are bound by the termination clause of contracts that they sign with book publishers. That said, if you feel that your publisher is in breach of contract, you may be able to terminate your commitments. The best thing to do is to find a knowledgeable lawyer to represent your case. Writer, Can You Help? Did you have an experience with an author mill? Consider sharing your opinion in our comments section. One of the most important things to differentiate a trustworthy publisher from a mill is whether or not an ISBN (International Standard Book Number) can be secured. Without an ISBN most bookstores and many libraries won’t even consider carrying your book, regardless of quality or value.